It's Day Three of Thanksgiving Week. 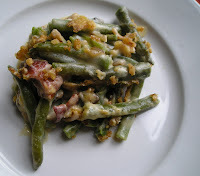 Today I have one more side dish for you. On Monday I shared my Roasted Apple and Bleu Cheese Mashed Potatoes and yesterday my Savory Butternut Squash Puree. How about a green veggie? I have never served (or eaten, for that matter) Brussels sprouts on Thanksgiving, but as soon as I was introduced to this awesome dish, I knew it would be Thanksgiving-worthy. I can't take the credit for finding this little gem; that honor goes to my awesome husband. Last year on National Men Make Dinner Day, he planned a great menu for us and it included these awesome Brussels sprouts that he found at Allrecipes. I was a little skeptical at first, because I had never cooked with sherry before, and honestly didn't know what it tasted like. I also wasn't a big fan of adding bacon to vegetables and covering them up with decadent sauces. I usually like to let the veggies stand on their own. But after just one bite, I was hooked! They are amazing and I have made them a few times myself since then. Preheat oven to 450°. Place Brussels sprouts on a baking sheet, drizzle with olive oil, and sprinkle with kosher salt. Toss to coat evenly. Roast in hot oven about 15 minutes, or until Brussels sprouts are golden brown. Remove from oven and set aside. Meanwhile, place the bacon in a large skillet, and cook over medium-high heat, stirring occasionally, until just beginning to brown at the edges, 5 to 8 minutes. Reduce heat to medium; stir in the shallot and mushrooms, then cook until the shallots turn translucent, about 5 more minutes. Stir in the sherry and cream until well combined. Bring the mixture to a boil, and stir until reduced by half. The thickened sauce should coat the back of a spoon. Transfer the browned Brussels sprouts to the sauce and toss to coat. Serve warm. I have decided that these Brussels sprouts will be a part of my Thanksgiving menu from now on. They are amazing. 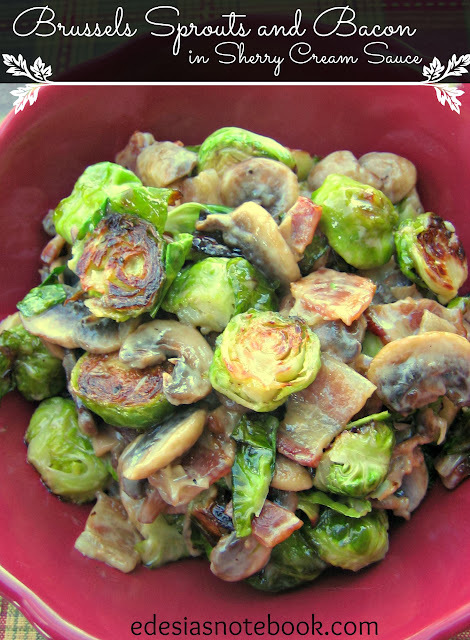 Roasting Brussels sprouts is the absolute best (if not only) way to make them, but then tossing them with bacon and sauteed mushrooms and shallots? Yum. And then the kicker is that it's all coated in a fantastic sherry cream sauce. The sherry is just perfect in here. It's just enough to cut the heaviness of the cream. Please, please, please, if you think you don't like Brussels sprouts, try them this way! Or if you cook for someone who doesn't like them. 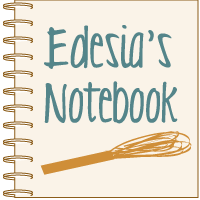 This recipe will make a convert out of anybody! These are definitely "special occasion" Brussels sprouts and they are just perfect for Thanksgiving. Please try them and let me know what you think. Here's my other favorite Thanksgiving veggie dish. Similar to the old familiar green been casserole, but with bacon, fresh mushrooms, and a cheddar cheese sauce instead of the canned soup. Tomorrow's post will be doing double duty. It is a main dish that would be a perfect alternative if you aren't a big fan of turkey, or if you are one of those families who makes a turkey and then another meat main dish. It's also my recipe for this month's Improv Challenge. So your hint is that it contains orange and cardamom. Check it out tomorrow!